"Scotia Regnum" from Blaeu's Theatrum Orbis Terrarum, Amsterdam, ca. 1640-1660. 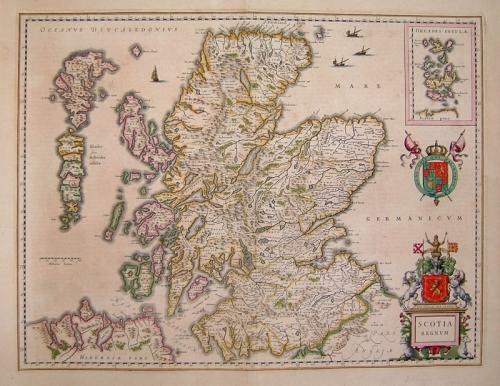 A very decorative double page folio map of Scotland. Willem Janszoon Blaeu (1571-1638) was arguably the greatest cartographer of the 17th century. He published his first atlas in 1630 and expanded this atlas repeatedly through his life, a publishing project that was continued by his disciples and sons after his death. Fine map with wide margins and original hand colouring that has been retouched. In excellent condition with very slight text show-through from the verso.